Worldwide, more and more people are living in cities, with suburbs conceived as appendages to the city, rather than being part of the city system, which is densely populated and offers a full range of services. But suburbs are not the city spread too thin, and in fact hold potential for a lived complexity as satisfying as that assumed to be available in inner cities. Just as the ecological function of wetlands was ignored by modernist planning, and swamps once-drained are now recognised as vital to water cycles, suburbs are increasingly recognised as part of a city’s wellbeing with their own alternative ideology and opportunities for urbanity and ecological sustainability. Suburbia Reimagined shows how such subdivision structures can offer new possibilities for sustainably integrating living between generations and between established and arriving migrant communities. The authors worked locally and internationally with university campuses, shopping centres, hospitals, airports, and other large entities spread through suburbia, to identify a broad range of suburban situations that have been modified to ensure that residents have a full access to amenities and services. The book addresses the history and design of suburbia, from the post-war soldier settlements of the 40s and 50s to the university hinterlands of Silicon Valley in order to reappraise the locked potential within such subdivision patterns. 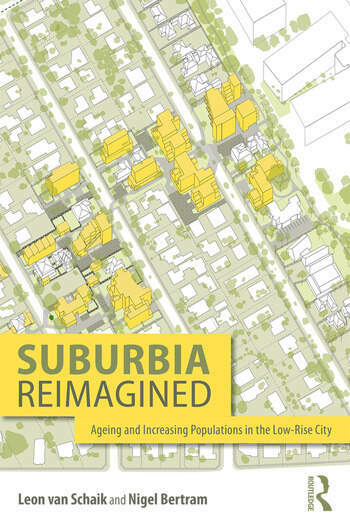 The authors propose a new model forward, examining case studies ranging from repurposed malls and railways for ecological sustainability to cul-de-sacs as social units and post-industrial factory conversions, ultimately showing the nascent patterns in suburbia that have the potential to support a rich life for all age groups. Leon van Schaik is a Royal Melbourne Institute of Technology professor of architecture holding a design practice research chair. His publications include: Practical Poetics in Architecture (2015); Meaning in Space (2012); Procuring Innovative Architecture (2010); and Spatial Intelligence: New Futures for Architecture (2008). Nigel Bertram is a director of NMBW Architecture Studio and practice professor of architecture, Monash University. NMBW’s architectural work has been published and awarded across categories including urban design, housing, small public works and adaptive reuse of existing buildings. His previous publications include Furniture, Structure, Infrastructure (2013).